Who will pay rising development costs? Regulators and consumers keep demanding that automakers pack more features and equipment into vehicles. But all of that comes at a cost -- which somebody ultimately has to pay. It's a conundrum that's bound to keep squeezing automakers' product-development budgets tighter in the coming years, as technology races on and fuel economy standards grow stricter. From 2010 to 2014, mainstream automakers' capital expenditures and spending on r&d jumped 63 percent, or more than 12 percent annually, according to Fiat Chrysler CEO Sergio Marchionne. At that rate, such spending would be double last year's levels by the end of the decade. It would be difficult if not impossible for most automakers to absorb those increases without major price hikes. Some companies are altering their product plans for the coming years to avoid making vehicles too expensive to be competitive. 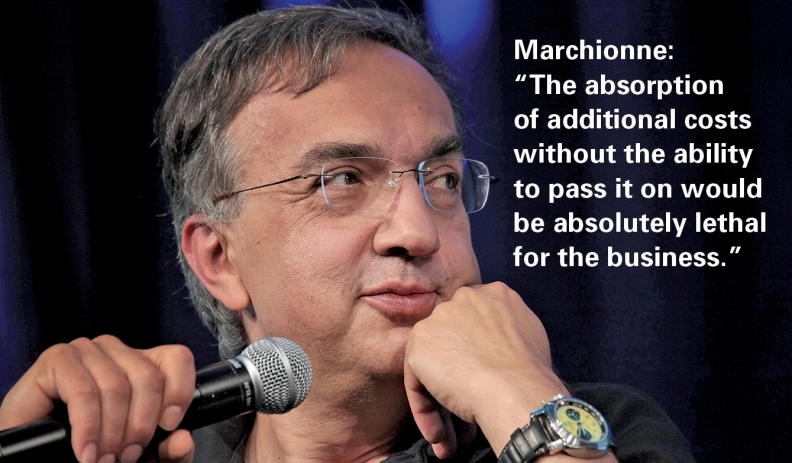 "The absorption of additional costs without the ability to pass it on would be absolutely lethal for the business," Marchionne said in April. "So there is no option. It will all be passed on, in some fashion or another." Marchionne cited a lengthy list of regulatory- and customer-driven forces that will push development costs up, including emissions laws, new powertrains, safety technologies, advanced infotainment systems, vehicle-to-vehicle communication and autonomous driving.